Anthropology, Economics & Finance, Education, Psychology, History, Law, Management, Political Science, Tourism. Situated in the northwest of the country on the Vltava River, Prague is the capital and the largest city of the Czech Republic. This magical city of bridges, cathedrals, gold-tipped towers and church spires is also the fourteenth largest city in the European Union. The city is home to about 1.3 million people, but its larger urban zone has approximately a population of nearly 2 million. Since the Middle Ages Prague has cherished the reputation of one of the most beautiful cities in the world as well as the political, cultural, and economic center of central Europe. The city was founded during the Romanesque era and flourished during the Gothic and Renaissance periods, it was also the seat of two Holy Roman Emperors and therefore the capital of the Holy Roman Empire. Later Prague became an important city to the Habsburg Monarchy and its Austro-Hungarian Empire, after World War I it became the capital of Czechoslovakia. In 1993, after the split of Czechoslovakia, Prague became the capital city of the new Czech Republic. The surface area of Prague is 496 square kilometres and has a total population of 1 226 697 people recorded in 2011. The major river is the Vltava River, which runs through the city at 31 km with the maximum width being 330 m. There is also a great number of islands on the Vltava River, such as the charming Kampa Island, the Slav Island in the vicinity of the National Theater, or Children Island. These islands serve not only as a perfect getaway from the hustle and bustle of the city center, but are also often the site of many cultural events. There are 22 administrative areas and 112 cadastral territories in the city of Prague. Prague’s city centre is compact. From Wenceslas Squareon one side to Prague Castle on the other is just a 30 minutes stroll (walking via the Old Town, across Charles Bridge and through the Lesser Town). 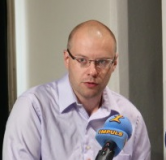 Keynote presentation: “Political Parties Funding and Election Campaign Monitoring in the Czech Republic”. 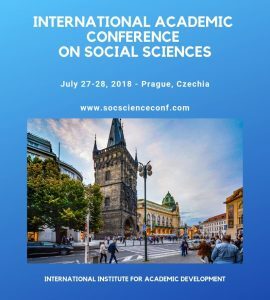 All papers accepted for the International Academic Conference on Social Sciences – IACSS are published in a Special Volume of the electronic Conference Proceedings or Edited Book. 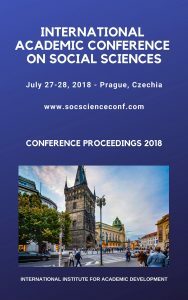 Please find proceedings of last conferences here.